Researchers on the Compact Muon Solenoid (CMS) experiment at CERN's Large Hadron Collider near Geneva, Switzerland, have seen hints of what may be the hot, dense state of matter thought to have filled the universe in its first nanoseconds of existence. The CMS detector has captured a signal thought to represent this quark-gluon plasma. Quarks are generally trapped in groups of two or three by the gluons that bind them, but in the moments after the big bang, the universe was so hot that they could escape, becoming a fluid of free quarks and gluons. Whether this really is a quark-gluon plasma is still unknown, but the CMS team hopes to find an answer shortly. "What is happening may be fully understood in the next few months or year," says CMS spokesman Guido Tonelli. "We're within a billionth of a second of the Big Bang," CERN spokesman James Gillies told AFP back in March, 2010. The new stage, dubbed "First Physics", marks only the beginning of an initial 18- to 24-month series of billions of such collisions. The LHC, which is located in a tunnel under the Franco-Swiss border, ground to halt with a major breakdown within days of its launch in 2008. But the huge scientific experiment then passed several groundbreaking milestones since it was restarted from repairs last November. Scientists around the world will sift through and process the data on a giant computer network, searching for evidence of a theorised missing link called the Higgs Boson, commonly called the "God Particle". "In this kind of physics, what's important in order to observe new phenomena is to collect statistics," said CERN scientist Despiona Hatzifotiadu. "It will give us a clue of how we were created in the beginning," she added. The experiment also aims to shed light on "dark matter" and subsequently "dark energy", invisible matter or forces that are thought to account together for some 96 percent of the cosmos. At this stage the LHC is still running on only partial power. It is designed to run collisions at twice the current energy — 14 TeV, equivalent to 99.99 percent of the speed of light. CERN is aiming to cross that threshold with the giant, cryogenically-cooled machine after 2011. At full power the detectors in cathedral sized chambers should capture some 600 million collisions every second among trillions of protons racing around the LHC 11,245 times a second. 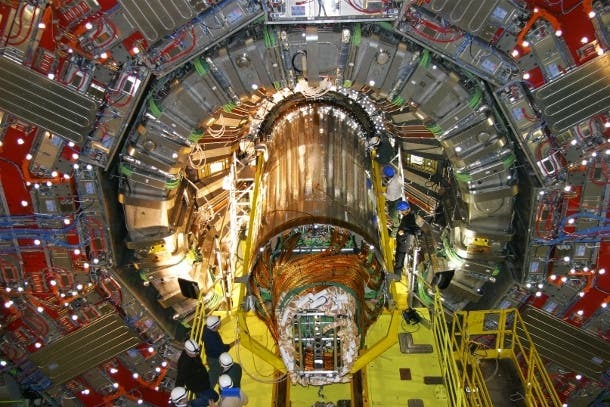 CERN researchers plan to keep the LHC running until the end of 2012, rather than 2011 as previously scheduled. The 27-kilometre collider at the particle-physics laboratory CERN near Geneva, Switzerland, had endured delays and a crippling breakdown before finally surging to life late in 2009, and physicists say it is now performing above expectations. Predictions of mini black holes forming at collision energies of a few teraelectronvolts (TeV) were based on theories that consider the gravitational effects of extra dimensions of space. Although the holes were expected to evaporate quickly, some suggested that they might linger long enough to consume the planet. But scientists at the Compact Muon Solenoid (CMS) detector now say they found no signs of mini black holes at energies of 3.5–4.5 TeV. Physicist Guido Tonelli, the detector's spokesperson, says that by the end of the next run, the LHC should be able to exclude the creation of black holes almost entirely.